There is no record for post-Roman Gaulish history but that of Gregory of Tours. The author of the so-called Chronicle of Fredegar reproduced, in essence, an abridgement of his first six books, with a little extra material here and there (eg. he located the forest where Lothar, assaulted by Childeric and Theudebert, hid); and all subsequent historical traditions reproduce, with embellishments and legendary additions, Gregory and pseudo-Fredegar's accounts. No trace of an alternative account seems to exist. Some of the traditions later appended to Gregory's account do however seem to have some claim to historical accuracy. We know that the Franks fought against Attila by the side of Romans and Visigoth armies at the decisive battle of the Campi Catalauni [the Catalaunian Plains]; and we know that Childeric, father of Clovis, was the son of one Meroveus [Merovée], with whom the family began; we are not therefore surprised to find Meroveus, in post-Fredegar sources, at the Campi Catalauni, playing as large a role in the defeat of the Huns as national pride indubitably demanded. It is probably a learned invention based on the scrutiny of descent tables and chronologies, but it is, if so, a highly likely one. One such note, however, does seem to have a connection, both unlikely and tempting, with matters explored here. In about 1516, Philippe de Vigneulles, from Metz, wrote a Chronicle with the remarkable notice that Gillons le Romains... olt... comme on dit, moult affaire au roy Artus d'Angleterre: "Aegidius the Roman... had... as they say, much to do with king Arthur of England". This is inserted in the Gregory-derived notice that, following a revolt against Childeric, the same Gillons - that is, Aegidius - was for eight years king of the Franks. Now Just Who Was Arthur? While we don't know what to make of this particular Gregorian notice, which probably amounts to no more than a Frankish decision to align themselves to the Roman party in north Gaul and throw out a particularly obstreperous chief ; it certainly belongs to the most ancient stratum of the material. But Philippe de Vigneulles' addition to it certainly does not: neither Gregory of Tours, nor any writer, whether of history or of romance, in the nine hundred years between Gregory and him, ever so much as hints at a relationship between Aegidius and Arthur. Properly speaking, the Franks did not have any overall king until Clovis himself. His father cannot have been more than one of a number of tribal leaders. Philippe himself, a charming man and a writer of great honesty and attraction, was in the habit of reproducing his sources virtually unchanged. His editor tells us so , and I do not see any reason to doubt his assessment. As most of his sources are in existence, we can check what he did with them; and checking carefully tells us a strange story. Charles Bruneau (ed.) - La Chronique de Philippe de Vigneulles, Metz 1927, introduction to Vol 1. For the passage itself, Vol 1, p88-89. The passage occurs at a point where, having ceased to follow his principal source - a writer called Jehan Lemaire le Belges - he has turned to the account of Frankish origins of Robert Gaguin or Gauguin , reproducing, among other things, a chronological mistake of Gaguin's. According to Gregory, the Thuringian queen Basina was supposed to have left her husband for Childeric as Childeric was still in exile and friendless; according to Gaguin, she did so when he had already returned and expelled "Gillon" . But here is the rub: Philippe not only inserts his notice about "Gillons le Romains" having much to do with "le roy Arthus d'Angleterre", he also edits out a whole passage of Gaguin's, and by doing so he quite alters the weight and meaning of the story. Gregory and Fredegar both had nothing more to say about the events than that Childeric, when he was expelled, broke a coin in two, gave half to an unnamed faithful friend, and told him to send it to him when it was safe for him to return. 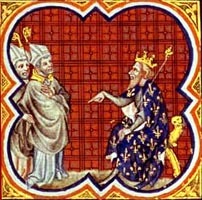 By the time the story reached Gaguin, the faithful friend had gained a name - the un-Frankish-sounding Guinemault - and a legend of the "evil adviser" type: Gaguin tells that he became the new king's adviser and so misled Gillon (who sounds rather thick) that Gillon started a savage period of tyranny against the Frankish lords, at the end of which they were only too glad to call Childeric back. This was the story that Philippe edited out of Gaguin's account, removing from Gillon/Aegidius the taints both of stupidity and of tyranny. In Philippe's story we are simply not told how and why Childeric came back. However, Philippe has not actually gone back to Gregory's original. Gregory, who did not bring Childeric's friend anywhere near Aegidius, did give a reason for Childeric's recall: over a period of eight years, he says, the friend had carried out a quiet, dogged work of propaganda and slowly won the Frankish nobility back to their own king. What is more, in eliminating Gaguin's version of the story, he has also lost the Gregorian chronology: with him, it does not take Childeric eight years to come back - ne demourait guerre que ledit Childeric, par le conseille et aide de son ami Guinemault... retournait arrier et fut remis et restitués en son royaulme et seigneurie: "it was not long before the said Childeric, thanks to the help and advice of his friend Guinemault... came back and was put back and restored in his realm and lordship". Compendium Roberti Jaquini super francorum gestis, Paris 1500, Folio 4. Interestingly - though this is nothing to do with our purpose - Gaguin calls him by the name "Gillon" even in Latin, and does not seem aware that Gillon or Giles is only the French version of Aegidius. Finally, Philippe retains from Gaguin the idea of a final battle for the Frankish lordship between Gillons and Childeric, fought at Bar-le-Duc, or possibly Bois-le-Duc; which, of course, is neither in Gregory nor in pseudo-Fredegar. In other words, Philippe has not gone back to Gregory or Fredegar: his account is still dependent on Gaguin's, except that he modifies it to make Aegidius look neither stupid nor criminal  - only rather unlucky – and to give him a grand last battle against Childeric. The association with Arthur must be part of this editorial intervention. Philippe de Vigneulles believed in the truth of chivalrous romances and actually incorporated the romance of Garin the Lorrainer into his Chronicle, taking that legendary hero for a prominent Metz figure and wondering aloud why previous historians had said so little about him; and therefore, if Aegidius, Gilles, Gillons, had been a prominent Arthurian figure, we could easily understand the reason for his wholly untypical editorial assault on Gaguin. Another contemporary chronicler, John Trithemius of Cologne, modified it in the opposite direction, eliminating Guinemault and making Aegidius - whose real name, unlike Gaguin, he seems to have known - to be criminal and tyrannical simply because he was. In this case, one may suspect some sort of native German anti-Roman prejudice. Only he is not. In neither of two reference works I have consulted  does a Giles, Gillon or Aegidius turn up, except for mention of – exactly – Philippe's statement. Given the huge size of the material, I cannot speak with absolute confidence, but it does seem safe to say that nobody by that name plays any notable or even noticeable part in the romances. 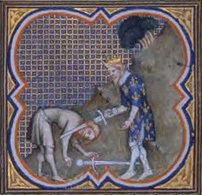 From my point of view, it is of course impossible that Aegidius – who died in 468  – should have had molt, or even little, affaire with king Arthur, who dates to a couple of generations later; but it would be very helpful to my theories if I could allow myself to trust, however little, Philippe's notice. It could, at least, be taken as evidence of close relations with Britain, such as I postulated in discussing him and his son Syagrius. Only I don't think I can. Where would such a notice have come from? Philippe could not read Latin, and any reference to Aegidius and Arthur he could have met would have been in French; therefore we would have to postulate a notice that survived only after having been translated into the vernacular, and which, in spite of dealing with the origins of the nation (always a favourite subject) and involving famous names of ancient history and legend, would have passed unnoticed by all the writers whom we do possess until it reached this Metz merchant, who, though pleasant and intellectually lively, was no giant of scholarship to track down obscure references no-one else had noticed! Carlos Alvar - Dizionario del ciclo di Re Artù (Giuseppe di Stefano, Italian Ed & Trans), Milan, 1998; and Ronan Coghlan - The Encyclopaedia of Arthurian legends, London 1992. In the plague, as mentioned in Gregory of Tours' description of the Loire war (II.18). And let us remember that this is Lorraine we are talking about. This is not, as in the case of isolated Welsh, Breton or Scottish monasteries, a matter of an isolated centre of learning carrying on its own highly individual traditions which both the rugged geography of the country and the isolation caused by a pugnacious warrior nobility always out to damage each other may have deprived of contact with other centres, so that wholly unique accounts may survive without being known elsewhere: this is a land of traffic and culture, the heartland of the old Frankish kingdom, densely settled and dense with monasteries, one of those areas which preserved a thread of learning even in such infamous centuries as the seventh, eighth and tenth. How likely is it exactly, when even some of the condemned writings of the heretic Gottschalck have survived, that such an item would remain so obscure that only one Renaissance chronicler - and not the most learned of them - would pick it up? Philippe himself does not encourage us to trust him. Usually the most scrupulous of men in the matter of sources, not only copying them word for word but carefully mentioning their names, here he says nothing else than comme on dit - "as they say". This suggests a vague rumour, probably verbal rather than written in origin - such a misunderstanding as may be born in the schoolroom between students who have forgotten some of their lesson or got two of them mixed together. We even have the possible reason for contamination: apparently, one Jean de Guise, in the previous century, had said that Aegidius and Arthur had been contemporaries. This is no more than the kind of standard chronological guesswork one meets dozens of times in medieval and renaissance historiography; but if Jean was a de Guise, then he was probably from Lorraine himself, and his notice may well have strayed, to become, in the loose talk of the only partly educated, an idea that Arthur - whom everybody knew had invaded France - had been connected with what was thought to be his Roman contemporary. I do not reject Philippe de Vigneulles' notice, but I think that it must be regarded as very dubious. Text copyright © Fabio P Barbieri. Reproduced with permission.